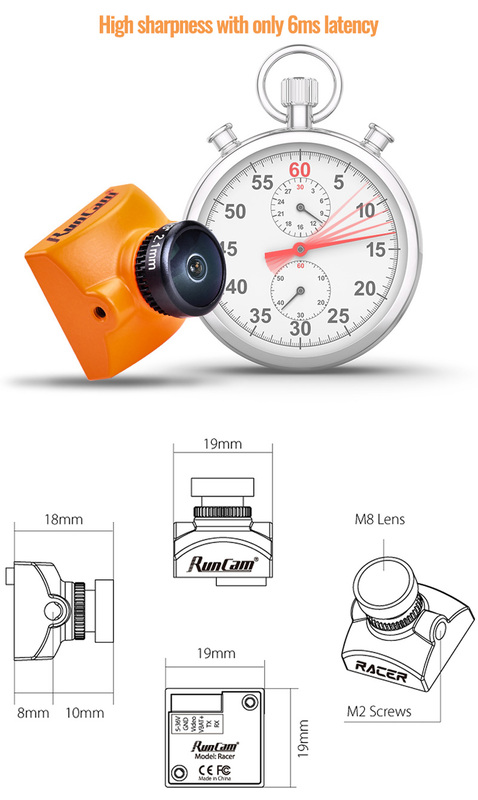 Runcam Racer 2 – 4:3 Micro FPV Camera – 1.8mm The RunCam Racer 2 is een low latency Super WDR CMOS FPV camera. Runcam Racer 2 – 4:3 Micro FPV Camera – 1.8mm beschikt is derhalve speciaal gemaakt voor racing quads die snelle en scherpe video nodig hebben. The super low 6ms latency from the 700TVL CMOS sensor will allow a lightning fast video feed and give you that locked in feeling. The Runcam Racer 2 has added switchable joystick and UART control so you can change between which method you prefer to control your FPV camera. The Racer 2 also comes in both 2.1mm and 1.8mm lens options. This ultralight Runcam Racer FPV camera (5.5g) comes with OSD and built-in remote control capability.